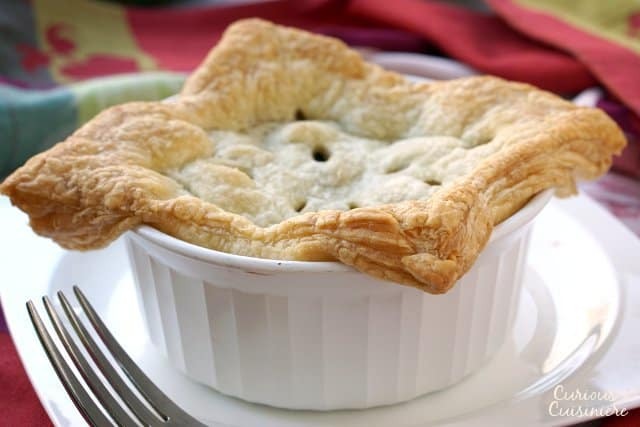 These individual Beef Burgundy Pot Pies evoke all the slow-cooked flavor of a traditional French Boeuf Bourguignon, with an added flaky pastry top! 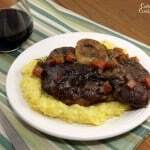 Beef, slow cooked in a deep red wine. And a flaky, pastry crust. 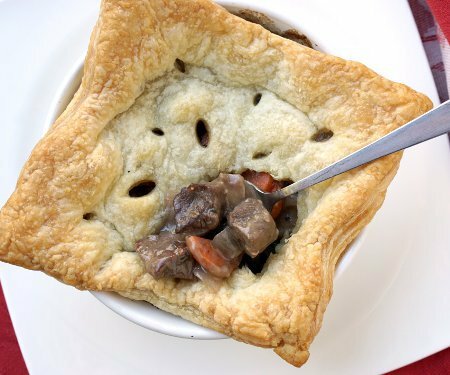 Well, the pastry crust might not be particularly traditional to the classic Boeuf Bourguignon stew, but just adds a certain layer of comfort to this warming dish. 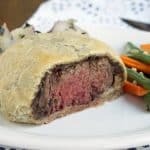 And we think puff pastry still holds true to the French flair of the dish. 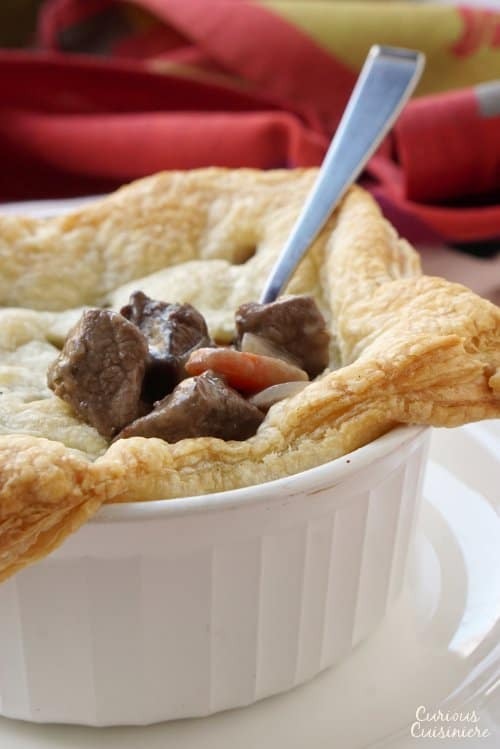 With the COLD weather we’ve been having, these Beef Burgundy Pot Pies are just the thing that we want for dinner as we get the fire roaring and pretend these single digit temperatures will be over soon. 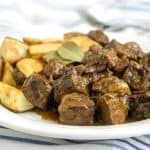 Beef Burgundy, or boeuf a la Bourguignonne, is a traditional French dish that comes from the Burgundy region in the east of France. It’s the region that gives us Burgundy wine (if you hadn’t guessed) and other wine-intense dishes like Coq au Vin. 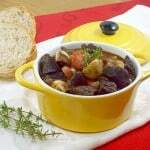 Boeuf Bourguignon was originally a peasant dish, a stew created to soften a tough cut of meat and make it palatable. However, as better cuts of beef became more readily available (we use ​Certified​ ​Angus​ ​Beef​ ​®​ ​brand beef, so we always know our beef is going to be flavorful and tender)​, the dish eventually evolved into the more high-class dish that we think of today. 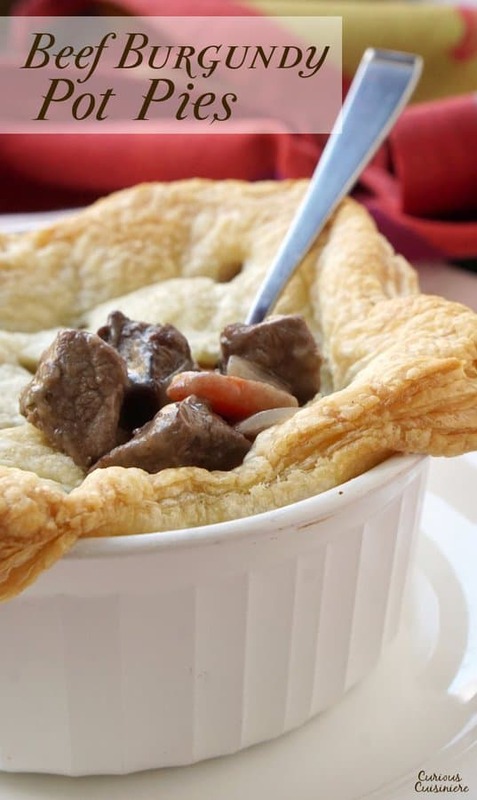 The deep flavors of the Burgundy wine permeate the chunks of beef as they simmer to create the base for this pot pie. Burgundy wine is made from Pinot Noir grapes that are grown and processed in the Burgundy region. So, if you grab yourself an inexpensive bottle of Pinot Noir (French of otherwise), you’ll end up with a Beef Burgundy that evokes the same classic flavors that a Burgundy would. 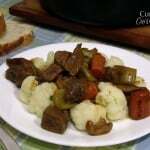 Using beef stew chunks for this dish helps the beef to cook more quickly, cutting down on the time that a typical braised beef dish like Beef Bourguignon would take to tenderize the meat. 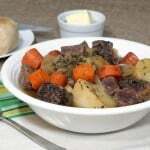 So, in about an hour, you have tender flavorful Boeuf Bourguignon. Now doesn’t that just seem like the right thing to do? 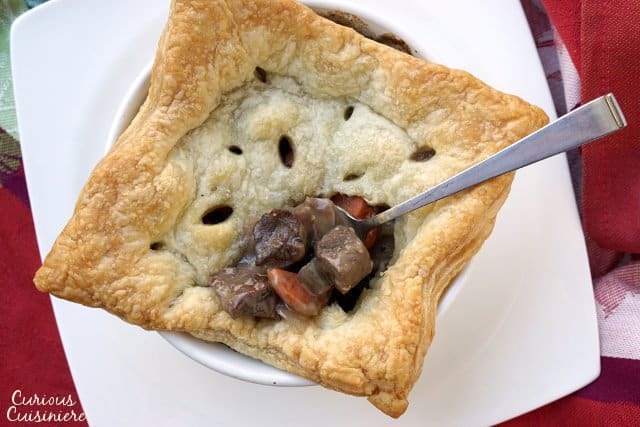 These individual Beef Burgundy Pot Pies evoke all the slow-cooked flavor of a traditional French Boeuf Bourguignon in an individual serving size! In a large, non-stick skillet with high sides, saute the bacon over medium high heat until crisp. Remove the bacon from the pan, but leave the fat. Increase the heat to high and add the beef stew cubes to the bacon fat. Sear the beef on all sides and remove it from the pan. If necessary, melt a little extra butter in the pan. Add the onions and garlic to the pan. Saute 3-4 minutes over medium heat. 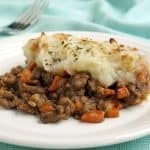 Add the mushrooms and carrots, and saute for an additional 5 minutes. Add the flour to the pan and mix until combined. Add the beef and bacon back to the pan along with the broth, wine, bay and thyme. Bring the mixture to a simmer and simmer for 15 minutes, until the beef is tender and the mixture has thickened slightly. Taste the mixture and adjust the salt and pepper, if necessary. Remove the bay leaf and divide the mixture between three (3) greased ramekins or oven safe dishes*. Roll the puff pastry sheet out slightly and cut into shapes to fit over the stew in the dishes. Cut steam holes in the pastry and lightly place over the ramekins. Bake, uncovered, 20 minutes, until the filling is bubbly and the pastry is golden. 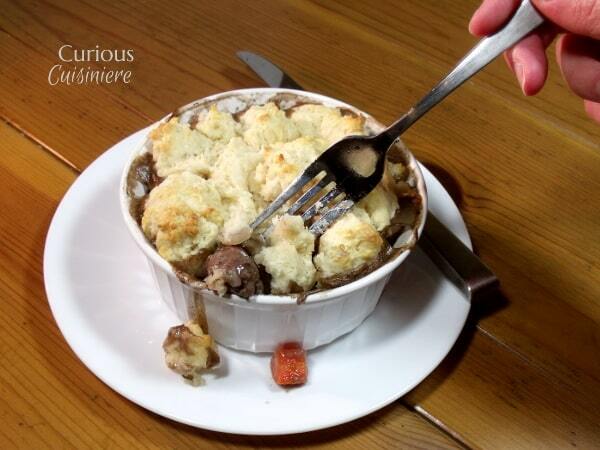 *One large casserole dish can be used, if you prefer. Cooking time may take slightly longer for the whole dish to become bubbly. 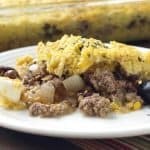 This recipe from 2014 was updated in January 2017. We changed the crust from a basic biscuit crust to a puff pastry crust that more adequately captures the French nature of this dish. Enjoy! Oh my goodness this dish was superb! 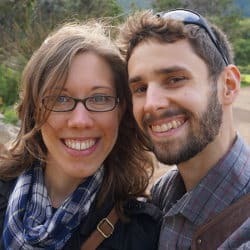 My husband and I made this together and it turned out beautifully. We usually eat on t.v. trays in the living room but when he saw it out of the oven he said, “this deserves to be eaten in the dining room” and was holding two of our Haviland dinner plates. Thank you for this fabulous recipe. 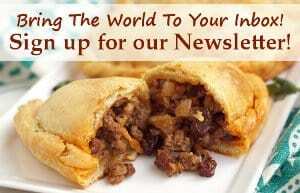 I have added my email address so I can receive your newsletter. 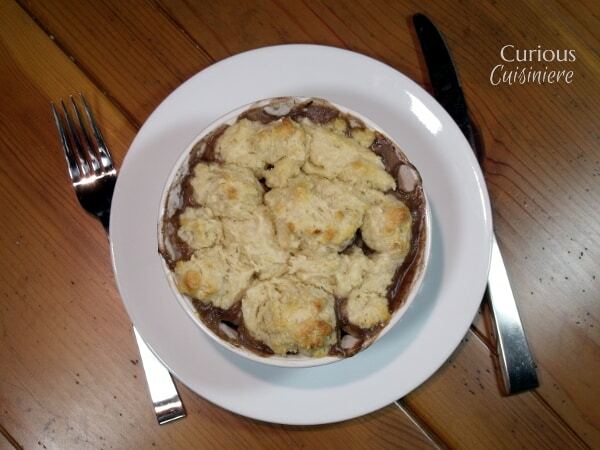 We’re so glad you enjoyed the boeuf bourguignon pot pies Annette! What a great excuse for an fancy dinner! I will definitely be making this!! Thank you! 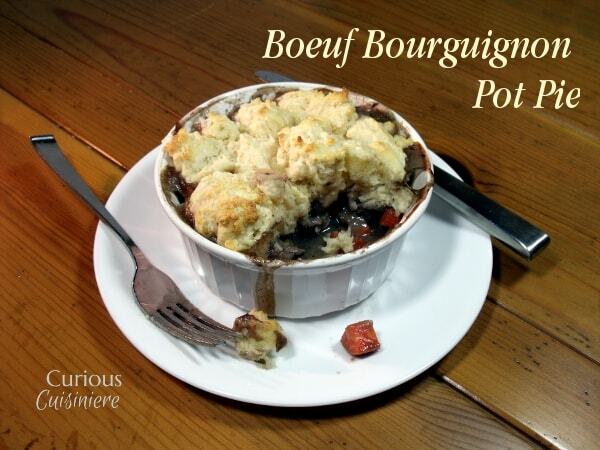 What a great idea to make it Boeuf Bourguignon into a pot pie, double yum!! !